The windows in the home provide more than protection from the elements to your family. They also provide the ability for you to see outside and to enjoy the sunlight, which can even help to warm your home when the weather is cold outside. 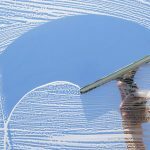 If you are like most homeowners, however, you do not clean your windows frequently enough and they may not be as clean as you would like. This is a problem that can easily be overcome when you contact Executive Window Services. We will provide you with the professional services that you need through a traditional method that is interesting to review. First of all, we use what is known as a microfiber strip washer, which allows us to moisten the window and can easily pull much of the dirt that is on the window away from the area. This is one of the first steps in the process, which really helps to set the precedent for the rest of the cleaning process. After the window has been scrubbed with the strip washer, we will use a Sorbonne 18″ squeegee with a pivoting handle. 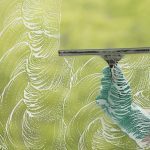 We do more than simply wipe the window clean with the squeegee, we use it professionally to get to the edges and to remove all of the debris which has been loosened by the strip washer. Another tool that we use is an Unger Ninja Bucket along with a belt which will help to hold the squeegee and the strip washer when we are working. This is very convenient and it allows us to have our hands free, so that we can pay close attention to your Windows and for safety concerns, when we are working on a ladder. Additional tools may also be used which we will use professionally to provide you with all of the benefits without the possibility of damaging your windows. Those tools include a professional scraper and very fine steel wool. Our traditional window cleaning method does not only focus on cleaning the window and removing the debris, it is focused until the very end. 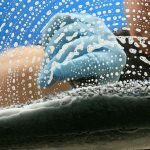 After we have used a squeegee and other tools on your window to get them clean, it is time for us to use a surgical towel. This towel is able to remove excess water from the edges of the window and for wiping the corners, so that you are left with a superior product from edge to edge. We recognize that homeowners want to have their windows clean but they are not always in a position to do so on their own. If you would like to have crystal clear windows in your home, you can contact the professional services of Green Clean Window Washing. Regardless of whether it is a single clean, a cleaning contract or even if you need to have windows replaced in the home, you can count on us to provide you with superior service.